For the second time in five days and 13th time since last fall, a bogus bomb threat prompted a security alert and evacuations Tuesday at Naval Base San Diego. 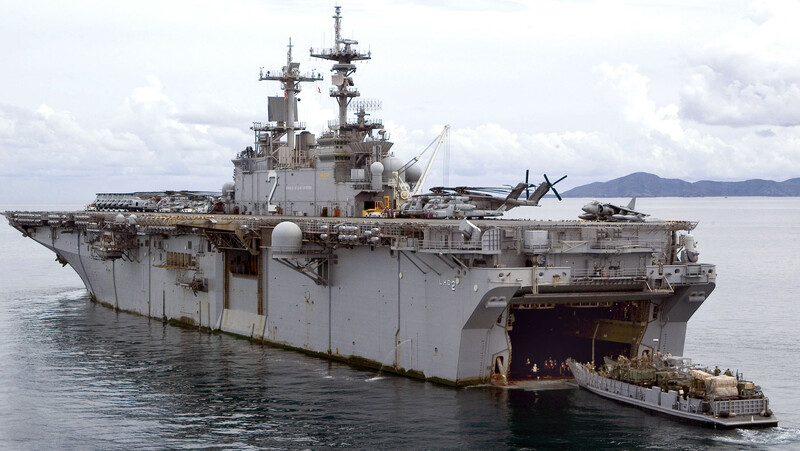 As they did Thursday morning, base officials cleared everyone off NBSD Pier 7 and put the moored amphibious assault ship USS Essex on alert after the menacing message was found, said Navy spokesman Brian O’Rourke. Military police personnel with scenting service dogs conducted a sweep of the dock and vessel, sounding an all-clear about 2:15 p.m., roughly an hour after the emergency began. Since early November, the installation on the east side of San Diego Harbor and two adjacent shipyards have been plagued with a rash of unfounded bomb threats. All of the messages have been found scrawled inside portable outhouses used by workers — as was the case Tuesday afternoon — or on walls of ships. Most have consisted of only a few words, including “bomb,” and a date. Investigators suspect that the same person or people may be responsible for most or all of the threats, O’Rourke said. A $5,000 reward for information leading to an arrest in connection with the crimes has been offered by BAE Systems shipyard — where, along with General Dynamics NASSCO, some of the messages have been found — and the Naval Criminal Investigative Service. Anyone with information about the threats is asked to call the NCIS at (877) 579-3648 or (619) 556-1364. « Presidential Election 2016: How Much More 'Fun' Can We Take?